Do you want to be in sales? Manage, train or coach sales teams? 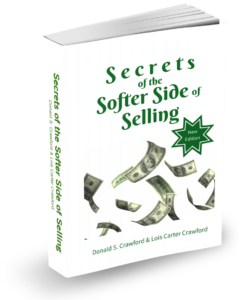 We wrote Secrets of the Softer Side of Selling, Second Edition just for you, the professional sales person who wants to sell more effectively, more ethically and win more often. There are just good, proven fundamentals that when repeated often, will put you at the top of your profession. How do we know? We are doing it every day. And have been successfully repeating the process for over 40 years. Now that’s staying power. We love to sell. Do you? But passion is not enough. The secret is doing the right activities, asking the right questions, and closing each deal. All while having fun. Need help setting appointments? Check out Chapter 15. Hate making cold calls? Chapter 17 will change that attitude. Trouble with difficult customers? The Secret is in Chapter 22. Never have enough prospects in the funnel? Load it up in Chapter 8. Reading is not enough. Do the exercises. OMG! you’re thinking homework. No, we give you guidelines to be your own sales coach to get you to the next level by practicing the fundamentals. And becoming disciplined in your daily work. To help you with the homework, we packed Secrets of the Softer Side of Selling, Second Edition with examples and anecdotes. Each day you will be amazed at how your techniques improve and you begin to add your own success stories. When you read this book and practice the fundamentals, we believe your life will change. As you improve your skills, closing ratios will climb, and success will follow. With diligent practice, we expect you will add to your income and improve the quality of life for you and your family. How do we know? It has worked for us, and when we have shared the secrets with others who implement the techniques, it has helped their sales increase. This book—through its easy-to-use, step-by-step process—gives you the skills you need to sell rings around your competition. Leave ‘em in the dust! We spill all the secrets so you become a sales champion. Order Secrets of the Softer Side of Selling, Second Edition on Amazon today. Most sales are lost because no one asks for the order.